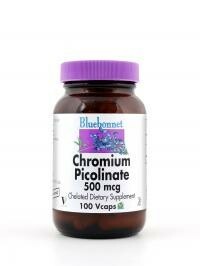 Bluebonnet’s Chromium Picolinate 500 mcg Vcaps provide pure chromium in a chelate of picolinic acid. Yeast-free ChroMax II® from Nutrition 21. Available in easy-to-swallow vegetable capsules for maximum assimilation and absorption.